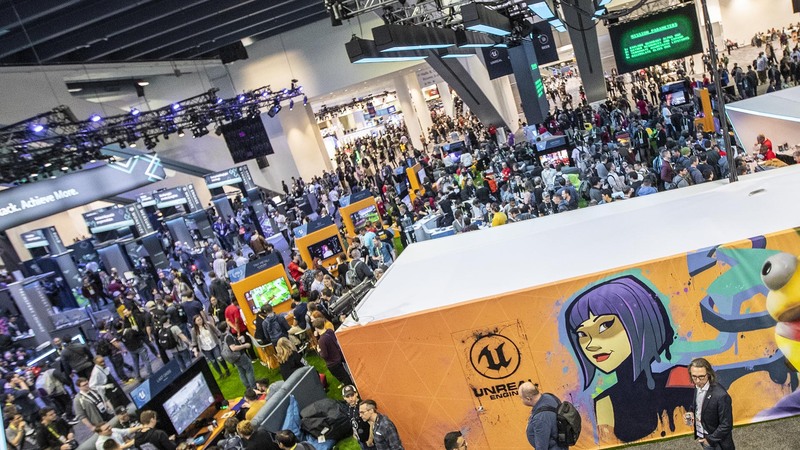 GDC is the biggest show of the year for Unreal Engine. 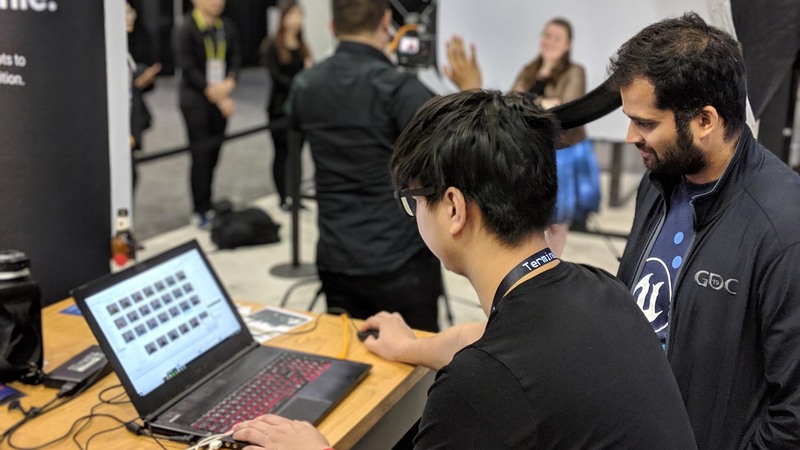 Whether working on new features, a demo that will be introduced to the attendees, or collaborating with partners to celebrate their tech, GDC is an all-hands-on-deck event. We are priveleged to help the talented Unreal development community showcase their projects on the expo floor; from an indie dev making a game completely in Blueprints, to an innovative AR technology taking digital interaction to the next level. In addition to teams showcasing teams in our booth, we were honored to have members of our Unreal Engine community join us—people who have found their passion in Unreal Engine and continue to share it in their unique ways. These individuals include content creators from the Unreal Engine Marketplace, indie devs who found their love of UE4 during a game jam, and a co-organizer of the most active UE4 groups in the world. They volunteered their time to be a resource for GDC attendees to interact with. Learn more about these community members here. In the days following GDC, we asked these folks to share their experiences with us. What was it like to represent Unreal Engine at GDC? Naveed: I was honored to be part of the Unreal Engine booth staff. Getting a backstage pass to see how hard everyone works at GDC was an amazing experience. I am sad that it is over, but happy to have been one of the lucky few that were chosen for this incredible journey. Jacob: I have been using the Unreal Engine for over 10 years now and so to feel like even a small part of that team for a moment, to be able to represent what it means for me, was very exciting and gratifying. Clinton: It gave me confidence that I was being supported and sponsored by the team that built a tool I use every day and that the works and contributions I have made to that community are important to Unreal Engine, its team, and its users. Abey: It has definitely been a huge morale booster for me and pushed me to be more involved in the UE4 dev community. It's such an honor for me to be recognized by Epic as an Unreal Engine ambassador! Knowing that I am a part of a community that not only helps others grow but finds ways to inspire future developers, was such an awesome honor. 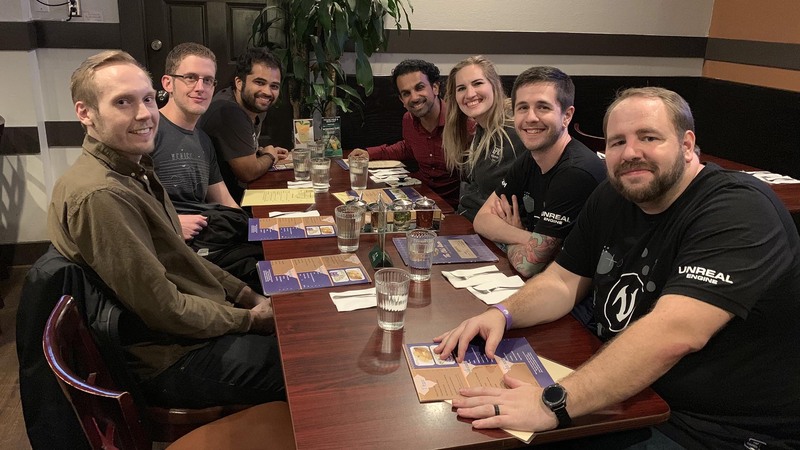 How did your relationships with members of the UE4 community grow during your time at GDC? Jacob: A few of the people that stopped by the booth had known my artwork and we had either chatted briefly online before or had never spoken before and simply knew of each other. A couple of these interactions were not planned and simply sparked from walking around and being recognized. While other interactions were with people I had spoken online with for years, but never met in person and I mentioned I would be at the Epic Booth if they wanted to stop by to say hi. Abey: One evening after the show was over, a group of us were walking back to the hotel chatting about UE4, sharing thoughts and ideas. I had a great conversation with a lot of people and only realized a day later that I was hanging out with Mathew Wadstein. I’ve been watching his tutorials and learning from him for a long time, so it was really cool to get to interact with him on the same level. Was there anything that caught you off guard? Abey: These two guys ran up to me and asked me if I was who I was. Then they pulled out a copy of their game and handed it over to me saying they used my climbing system to finish their game. I was blown away and humbled that a group of devs actually used my Marketplace asset in a finished project, especially when the asset they used is still a work-in-progress. We ended up talking more about how I had planned to get network replication and modularity working on the system and that got them excited about adding more features to the game as well. It was great getting first-hand feedback from some of the very early adopters of the climbing system! Jacob: I had a really cool conversation with someone working in the Navy who helped a team of artists fully scan a 3D version of the ship they work on. They used it in training exercises to get a better understanding of the layout of the ship, how to operate in emergency situations, and to help sailors understand their critical role as part of the ships' company. He explained that they used Unreal Engine to create the 3D scan, and it took their normally 14-18 months of training time down to around six months. Naveed: Being able to interact with members of the community such as Michael Allar, Jan Kaluza, and Mathew Wadstein was incredible. You watch and admire the work that these folks do, and before you know it, you’re on level ground with folks who have inspired you along the way. Being at GDC really helped bring the fact that this community really feels like family. What was the best moment of GDC for you? Naveed: Honestly, getting to meet Jacob Norris, who was part of the group that came with us was awesome. I interacted with Jacob many years ago about his Procedural Nature pack on the Unreal Engine Marketplace. It was one of the first packs I used when I got started in Unreal Engine, so it was nice meeting him in person and getting to know him. Clinton: There are too many to count, but something that really stuck with me was that I had students and aspiring artists that came up and knew who I was or were looking for me to meet at the booth was really great. I met so many of my past students and made friends and connections with some new learners as well. Seeing my assets used in one of the learning theater talks, and being recognized for it during each presentation was really great to see. I had an opportunity to discuss how I got involved in the Marketplace with others aspiring to find a way to participate. Abey: For me, I've been wanting to attend GDC for years! But having Epic invite me over and be part of the community team was out of this world! Everyone at the booth was very welcoming and made me feel like an integral part of the Epic family. Amanda was able to steal a few minutes from their busy schedule to discuss the team's GDC experience. Other members of the Unreal Engine community spent a ton of time helping out in the partner booth as well; it really drove home the feeling of community and working together for a common goal. A special thanks to Jan Kaluza, Mathew Wadstein , Matt Workman, and many others who played their part in the success of GDC 2019.